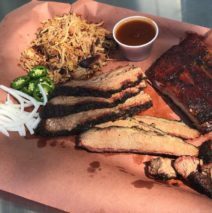 Blue Dog Craft Barbecue offers various barbecued items, such as smoked meats like Brisket, Spare Ribs, Pulled Pork, and Sausage. They also offer macaroni ‘n cheese, potato salad, coleslaw, collard greens, beans, fire roasted chile creamed corn, kale salad, and cucumber salad. They also have dessert selections, such as cookies, banana puddings, and tres leche cake.